Red plan is a plan for the city that is in an alarming (red) state. As a first step in the creation of such a plan, we need to locate the red or critical spots. 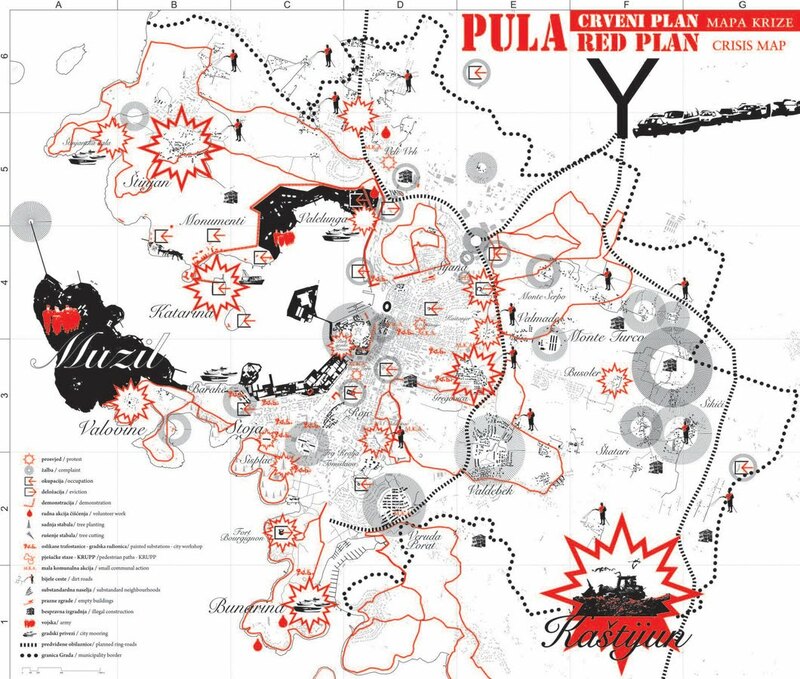 In order to do that, we created a "crisis map" of Pula: an image of the city in the age of late capitalism. The data used for the creation of this map was taken from the city section of the local daily newspaper Glas Istre in the year 2007. The events are categorized according to the type of activity (revolts, demonstrations, complaints, occupations, evictions, unauthorized construction, small communal actions, volunteer work. Apart from that, the map shows the points of potential future conflicts: abandoned buildings in the city, substandard settlements and dirt roads. All the activities shown on the map should serve as a starting point for the development of clear and functional forms of urban intervention. So far, these have been limited to discrete and temporary tactics aimed at changing the living conditions in the city. The goal of this map is to structure these actions and develop a strategy that would also change the living relations in the city.